The Skinny: Silly, forgettable action comedy starring bigtime HK actors. This early teaming of Tony Leung Chiu-Wai and Wu Chien-Lien is interesting because they’re so damn young and unskilled at acting. Chiu-Wai is a maverick cop (called “Beach Boy”) who spends most of his time sneering or acting obnoxious. 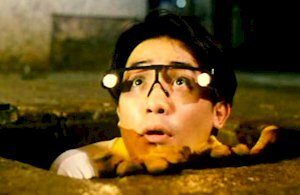 Wu Chien-Lien is ultra-cute as his live-in Mainlander, who he rescues after they take down her evil stepdad. Ng Man-Tat is the inept partner and Waise Lee is the dashing, but crooked captain.